Have you heard the word? The Wild Baker has been setting treats loose in the Dundee shop! 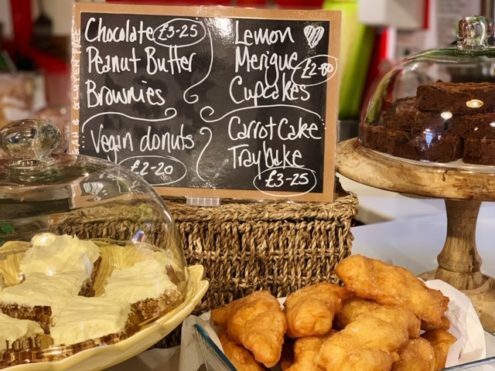 The BEST part is that these local, homemade cakes + bakes are VEGAN and GLUTEN-FREE. Yes. You read that right… but you can look back and re-read, in case you didn’t believe your eyes. Our Dundee shop’s lovely Mhairi has excitedly offered to share her baking talents with our shop. With her wealth of knowledge and shared appreciation for quality ingredients, this is truly a match. 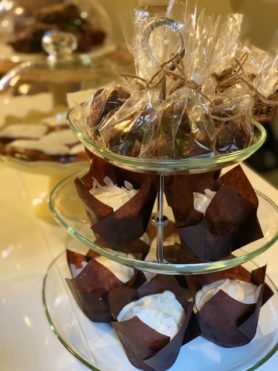 Mhairi’s Wild Baker treats are available exclusilvely at Heart Space Whole Foods Dundee, and we are immensely grateful for the enthusiastic support from our customers since the launch! We are proud of our Wild Baker, and we want to share her story so that you can get to know her too! 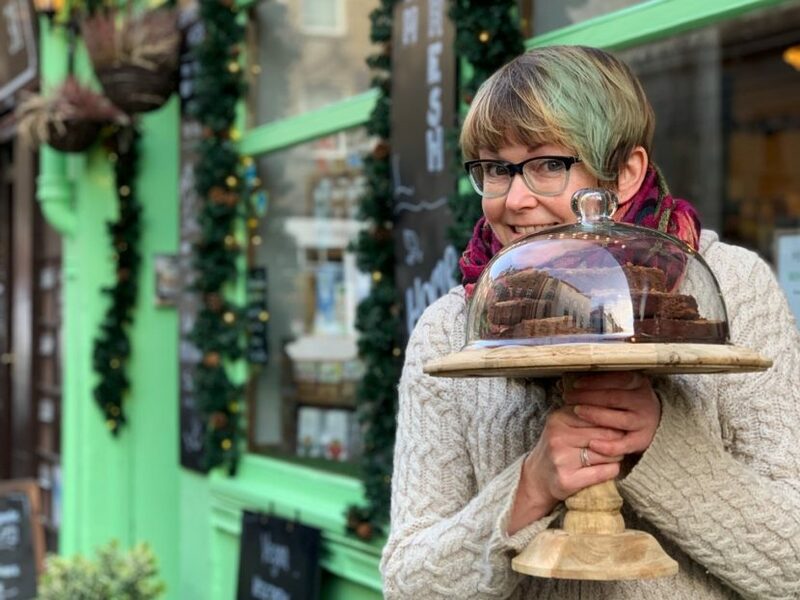 Originally born on the west coast of Scotland, Mhairi moved to the east coast when she was very young and began baking at home at the age of four! At 11 years old, she started working in her family bakery- and her experience grew even more from there. I’ve been Manager of the Dundee shop since October. I was a lecturer at DJCAD and had a studio at WASPS, but have moved to a bigger house and now have a studio at home. When I’m not working at Heart Space, I’m a freelance Artist working in both formal and informal settings around Scotland delivering workshops, and commissioned works of Art. How did Wild Baker come to be? We had a customer over Christmas who couldn’t get vegan mince pies anywhere, so I offered to bake them for her…and that’s when Wild Baker was born. Wild Baker, with a big heart! We love this story- and are certain our customer received quite the treat. What can we expect from the Wild Baker? There will be a brownie, muffin or cupcake, and traybake every week. So far I’m baking the most requested goodies, but will be asking for suggestions so keep an eye on Instagram. All the bakes are Vegan AND Gluten Free which is pretty difficult to find. I have no special diet requirements, but good baking should be available for everyone. Getting together over tea and cake is a universally loved pursuit. How about your favourite desserts to enjoy? My favourite cake is iced gingerbread, and I love tarte au citron, or a good lemon pavlova. 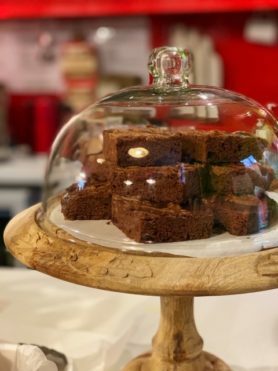 Mhairi has been a treat in the Dundee shop, and her baked goods have certainly been a special addition. She thoroughly enjoys interacting with the customers, and is eager to swap recipes and help people put meal ideas together. So, pop in for a visit! To see more of what inspires Mhairi’s creative life, look her up on Pinterest as Mhairi Wild.